In the late morning of 21 October 1805, sixty warships from the British and combined French and Spanish fleets came together in the battle of Trafalgar. We profile the two ships at the centre of the action that day, Admiral Nelson's HMS Victory and the French ship-of-the-line Le Redoutable. Type: 'First rate' ship-of-the-line. The British naval term "first rate" applied to a ship with at least 100 guns. Launched: Chatham, 7 May 1765, designed by Sir Thomas Slade. The Victory was ordered in 1758 - the year Horatio Nelson was born. At the time she cost £63,176 to build - some £50 million in today's money. Some 6,000 trees (90% oak) were used in her construction. Armaments: 104 guns including 12, 24 and 32-pounder cannon mounted on three decks. Marines armed with muskets positioned themselves in her 'fighting tops' amid the rigging during battle, acting as snipers. Victory's oak hull was some 2ft thick at her waterline. Service record: Launched just as the Seven Years War ended, Victory was put into store until 1778. After sustaining damage in the battle of Cape St Vincent in 1797, she was taken out of service and converted into a hospital ship. After substantial rebuilding, she returned to the fleet in 1803. Role at Trafalgar: Victory led the British line which intercepted the French-Spanish fleet off Cadiz. Her masts and rigging were damaged by fire from Le Redoutable as she neared the French ships, and she eventually passed behind Admiral Villeneuve's flagship, Bucentaire, closed in with Le Redoutable. Sailors and marines on Victory's upper deck came under deadly fire from French musketeers positioned in Le Redoutable's rigging, including the fatal shot which hit Admiral Nelson at approximately 1.25 pm. Type: 'Third rate', with 74 guns. Smaller than the Victory, her name translates as "formidable, tremendous - with an element of fear". Launched: Brest, 31 May 1791, designed by French naval architect Sané. Originally named Suffren, renamed in 1794 after being involved in a mutiny led by Vice-Admiral Morard de Galles. Armaments: 74 guns on two decks, including 8, 24 and 36-pounder cannon, including 4x36-pounder 'carronades'. Nicknamed "smashers", these close range guns fired heavy cannonballs, inflicting maximum damage to enemy ships and creating showers of deadly splinters. Service record: In 1802, Le Redoutable was the flagship of a squadron of two ships-of-the-line and four frigates under the command of Admiral Bouvet, and took part in successive expeditions to Guadeloupe and Santa Domingo. By 1805 she formed part of Admiral Villeneuve's fleet, commanded by capitaine de vaisseau Jean-Jacques Lucas. Role at Trafalgar: On 21 October 1805, Le Redoutable was positioned in the middle of the line of French and Spanish ships. At 1145 am, she opened fire on the approaching British column, led by Admiral Nelson. Closing with Victory, she held her own against the larger, more heavily armed ship for several hours, inflicting great damage, but sustaining massive damage in return from both Victory and later the Temeraire. Fate: Dismasted and heavily damaged by intense fire from both Victory and Temeraire, Le Redoutable sank in heavy seas a day after the battle, taking with her a number of wounded men still aboard. Of her crew, 169 men survived, many badly wounded, though most were returned to Cadiz under a truce and only some 35 taken prisoner, according to Captain Lucas official report. The name Le Redoutable lived on however, in the form of France's first nuclear missile-equipped submarine, launched in 1967. 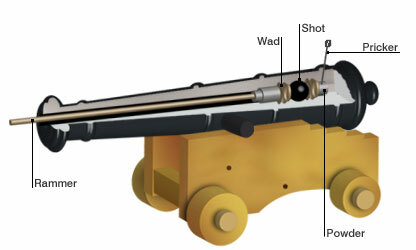 Firing procedure: The gunpowder charge and wad were inserted and packed tightly against the rear of the gun using the rammer. The wad ensured the charge was tightly compressed. The ball was then inserted, followed by a second wad to keep it in place. The wrapped charge was pierced with a pricker and fine gunpowder poured into the firing hole. The flint lock - which created sparks to ignite the powder - was cocked, and the gun ready to fire.